The first log (the largest) is for children to colour. Each row shows each position of prayer. As they learn and master how to correctly make sujood, rukoo, etc. they can colour in each corresponding row. When they have successfully learned all of the positions of the salat, there is a space for parents/teachers to give children a star sticker. 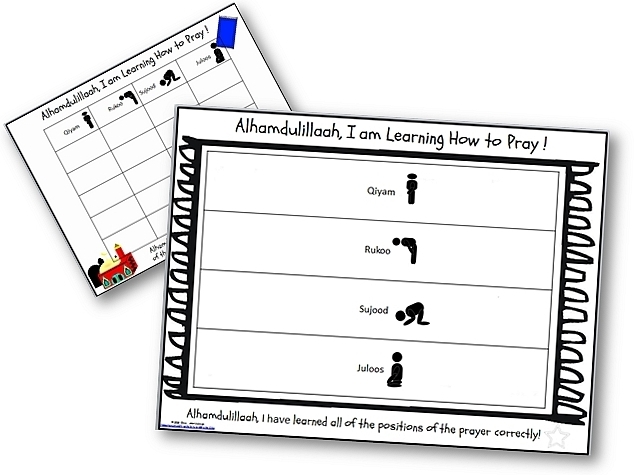 The second log (the smallest) is for parents/teachers to check off children's progress as they learn the positions of the salat. Click on the links above to download each log insha'Allaah. May Allaah accept your efforts and work!